After weeks of testimony from economists, survey experts and rival executives who oppose the merger, the defense on Thursday called its final witness in the trial that will determine the fate of AT&T's proposed acquisition of Time Warner: AT&T chief executive Randall Stephenson. Taking the stand early in the afternoon, Stephenson defended the $85 billion bid for Time Warner as a necessary means for AT&T to keep pace with tech powerhouses like Google and Facebook. And in contrast to the government, which has portrayed the merger as a weapon to reduce competition and hurt consumers, Stephenson depicted AT&T as a beacon of innovation, "a prestigious company" whose origins go back to the invention of the telephone itself. Today, Stephenson said, AT&T is in the "connectivity business," with the largest part of its portfolio coming in the wireless sector. Though he was being questioned by AT&T and Time Warner lead attorney Daniel Petrocelli, Stephenson often spoke directly to Judge Richard Leon, telling him AT&T has "re-invented itself many times over the years." It was in that spirit that Stephenson said he pursued the merger with Time Warner and its buffet of content -- from HBO to Warner Bros. to Turner channels like TNT, TBS and CNN -- which he called "the best library in the world." Stephenson said the media industry is "going through some significant disruption," particularly from technology giants: Netflix is able to deliver premium content straight to consumers, while mining data on those consumers' viewing preferences, while the likes of Google and Facebook harnesses their own user data to sell higher quality advertising. The merger with Time Warner would enable AT&T to check all those boxes, delivering content directly to consumers and learning more about them in the process, while allowing them to exploit that advantage to improve advertising sales. Stephenson spent time detailing how he came up with the idea to merge with a content company, saying that he kept coming back to Time Warner as the highest quality company that could be bought. A long lunch with Time Warner CEO Jeff Bewkes in 2016 ended with both men feeling "very excited about" a newly formed company. Some of Stephenson's handwritten notes from the period when he contemplated a merger in 2016 were entered into evidence, including a critical line that said the merger must create an advantage for AT&T's own content distribution without harming Time Warner's "need to be widely distributed" since the "value of a content company is how many people are watching." "The equation is real simple," Stephenson said. "The more people who watch your content, the more your content is worth." AT&T has pushed some variation of that argument throughout the trial. It's a counter to one of the government's key arguments that the newly formed company will use Time Warner content to exert unfair leverage over competitors, causing prices to rise while luring customers away from rivals and to AT&T's services. Stephenson is AT&T's final witness, and his testimony Thursday came the day after Bewkes appeared on the stand. The executives' appearances resulted in the largest turnout at the courthouse since the trial's opening days a month ago. Bewkes said in his testimony on Wednesday that Facebook and Google are absorbing a massive share of advertising dollars because their data allows companies to more effectively target consumers. On Thursday, Stephenson echoed that point, saying that Turner's advertising inventory is being "under-utilized," and will be "worth far more under the AT&T umbrella." He said that a given hour of programming on CNN will include 16 minutes of commercials, with two of the minutes given to distributors, such as the AT&T-owned DirecTV. 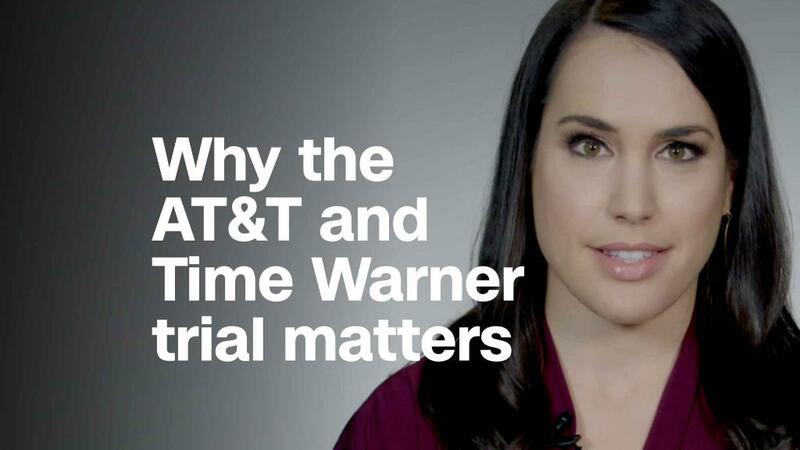 AT&T sells those two minutes, generating more revenue than Turner because the telecommunications company is able to provide advertisers with sophisticated data on the consumers watching their commercials. Greater advertising revenue, Bewkes said, "takes pressure off subscription revenue," and in turn shifts the "load from consumers to advertisers." That would counteract the price increase the government's expert economist has said the merger would cause for consumers. Stephenson said some of the government's main theories in the case were "absurd," arguing that it "defies logic" to think Turner content would increase in worth just because of the merger. He also called the government's allegations that AT&T would have an incentive to coordinate with Comcast-NBCUniversal to harm new streaming companies "a stretch." The more people consume content, the better it is for AT&T because that means they're using its wireless services, Stephenson said. On cross examination, the government's lead attorney Craig Conrath tangled with Stephenson over the definition of a vertically integrated company. Conrath said Stephenson claims AT&T and Time Warner are competing with vertically integrated companies like Netflix, but noted Netflix does not own the pipes or platforms on which people watch its content. Those pipes are owned by companies like AT&T, Conrath said. Stephenson conceded companies like Netflix have to use others' pipes, but argued they were vertically integrated as they create the content and deliver it directly to consumers, engaging in a relationship that gives them valuable data on their customers' viewing habits. Conrath also tried to argue that the pay television business is still lucrative and large, despite the fact it is in decline. Stephenson said that argument reminds him of when the telephone industry was shifting to wireless, a change that hit them faster than they were expecting. In an attempt to undermine Stephenson's claim that Facebook is a threat, Conrath entered into evidence emails between the AT&T chief executive and Facebook founder and CEO Mark Zuckerberg, in which the two discussed working together on advertising capabilities. Stephenson said it's completely possible to be both customer and competitor in an attempt to play down the significance of the email exchange. Before Stephenson was released, Leon asked him, "Where do you think this ecosystem will be seven years from now?" Stephenson said, if you had asked him seven years ago he would've been off in his prediction. But he predicts that content creators "will have direct and immediate access to consumers -- we've seen an explosion of that." Prior to Stephenson's testimony, Thursday's proceedings began with the resumption of the government's cross-examination of John Stankey, AT&T's senior executive vice president in charge of the Time Warner merger integration planning, which means he would lead the Time Warner companies if the merger goes through. The remainder of Stankey's testimony was marked by fits and starts, with extended conferences occurring at Leon's bench over internal documents that Justice Department lawyers attempted to have admitted under seal. Several of those documents were blocked by the judge though, including a presentation from an investment bank made to Stankey which suggested that buying a content company would give AT&T leverage over competitors. Observers in the courtroom are unable to hear those deliberations, as Leon turns on a white noise machine to obscure the discussions. AT&T and Time Warner rested their defense on Thursday. The government then began calling up rebuttal witnesses.